The cemetery was started in the 1920s and was known as Old Genoa Cemetery. In 1955 the cemetery was expanded and the owner's family planed acorn seeds along the roadways. The beautiful trees you see today are a result of that planting over 50 yrs ago. The fully grown trees now tower over the cemetery and provide a comforting and peaceful place to visit. 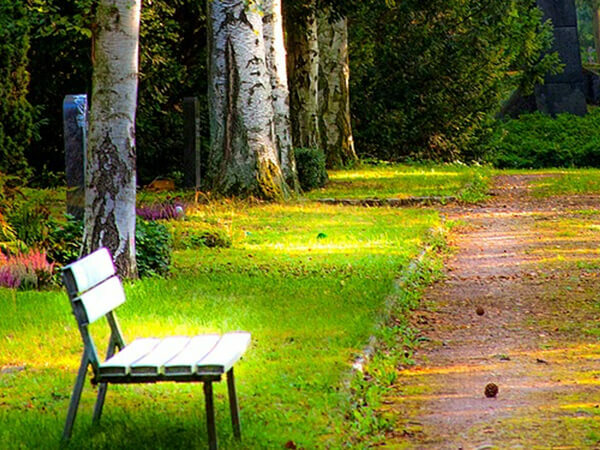 We believe that there is more shade per acre than in any other cemetery in Houston. In the 1980s, the cemetery added a beautiful mausoleum with deep blue pearl granite and marble interior accents complete with a chapel for committal services. At the end of 2016 Saber Management acquired the cemetery and since then there have been some additional upgrades to the property, such as paving roads and landscaping. There was a new Luminary program introduced in December featuring lights on the trees and lights placed on graves. There are plans for a new mausoleum project that will have at least 9 garden mausoleum buildings providing many families a peaceful resting place. Also, we recently acquired an additional 15acres toward Monroe Street which will give many more burial options for our families, including ground burial, mausoleum entombment and inurnment. Losing a loved one is a very emotional time, and we would like to take this time to share stories and memories to pay tribute to your loved one. In the coming years we hope to make the surroundings the most comfortable for you during this difficult time.